The idea for Ancestors in the Garden was conceived by DeWayne Barton, co-founder of Hood Huggers International — an organization that raises awareness about the needs of Asheville’s black residents — and the Burton Street Peace Garden. Barton grew up in the historically African-American Burton Street neighborhood of West Asheville. 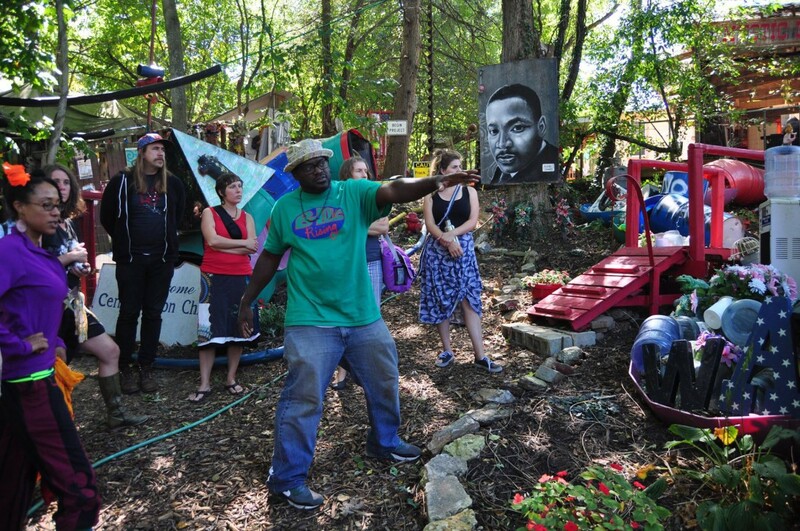 In 2003, to combat the drugs, violence and social apathy he encountered in his neighborhood, he created the Peace Garden as a gathering place for the community and, with time and effort, was able to turn an overgrown lot into a thriving recycled-art sculpture garden and food-growing space. On Saturday, June 3, Hood Huggers will celebrate a new partnership with Voices United (a youth theater program that teaches young people to write, produce and perform in their own musicals) and Asheville Creative Arts (a local children’s theater company) by producing Ancestors in the Garden, a music and art event at the Peace Garden. Barton says that the focus on ancestry is about “looking to the past to help inspire and guide our direction in the future.” There will be theater workshops throughout the day, and local musical acts Spaceman Jones, Natural Born Leaders, Monk and Jonathan Santos will perform. 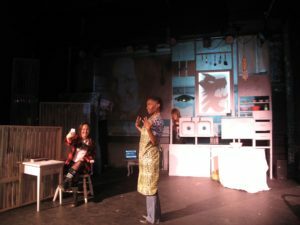 Asheville Creative Arts’ newest production, The Little Red Riding Hood Show by Russell Davis, is a trippy take on a timeless tale that is known the world over. 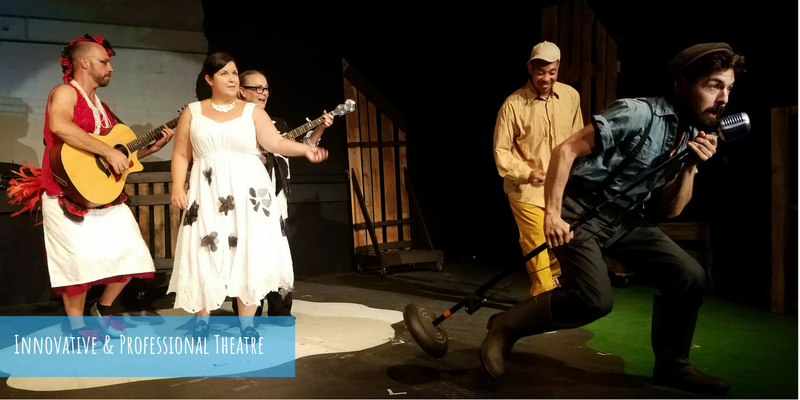 It runs through Sunday, April 9, at The Magnetic Theatre. This fact is pointed out early on by the ultraself-aware Red, who is a modern teenager trapped in an old-world story. Meanwhile, her smart phone is a permanent extension of her hand, it would seem. The need to capture and share her life on Facebook live is as much her central preoccupation as is preparing for her trip through the woods to Grandma’s house with a basket of goodies. The stage is an inventive tapestry of realism-meets-abstraction, thanks to the clever direction by Abby Felder and Katie Jones. Red’s mother’s kitchen is vertical, arranged on an upstage wall. The sink, the cabinets and utensils are all realistic, but the arrangement is far from it. If you’re a kid (or a parent) in Asheville and the surrounding area, you’ve pretty much got it made as far as age-targeted arts programs are concerned. For young visual artists, inspiration can take hold at the Asheville Art Museum — under renovation for a bigger and brighter future — or in the River Arts District, where certain studios offer demonstrations or classes for adults and kids alike. Over on the performing arts side of the spectrum, though, the kids’ programming is especially rich, and local theater troupes like Asheville Creative Arts and Bright Star Touring Theatre offer fun, inspiring and often educational work that younger (and older) audiences have enjoyed for more than a decade. Asheville, NC- Asheville Creative Arts (ACA), Asheville’s professional children’s theatre has unveiled its new brand and brand new initiatives for its 5th Milestone Season, which will include innovative mainstage productions, THE LITTLE RED RIDING HOOD SHOW and CLICK, CLACK, MOO: COWS THAT TYPE, plus the continuation of its Incubator Series with BUGS, a new musical by Jonesalee, and expanded educational outreach with after-school classes in acting and creating theatrical stories. Tickets and registration information will be available on ACA’s website, visit for more family entertainment.